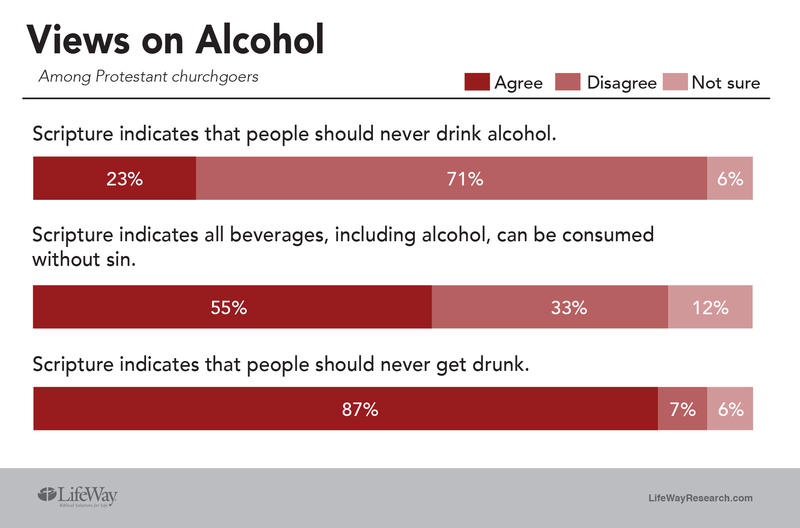 NASHVILLE, Tenn. — Most churchgoers say the Bible teaches against drunkenness. But that doesn’t stop about 4 in 10 from taking a drink now and then. In a 2007 phone survey by LifeWay Research 39 percent of Protestant churchgoers said yes they consumed alcohol while 61 percent said no. Gallup surveys over the last 75 years have typically shown that two-thirds of all American adults have occasion to drink alcoholic beverages including 63 percent in 2018. When Christians drink socially, many churchgoers believe they could cause other believers to stumble or be confused. In 2017 60 percent agree and 32 percent disagree. The portion who say drinking socially could cause others to stumble dropped slightly from 63 percent in 2007. Churchgoers ages 18-34 are evenly split on their alcohol consumption with 50 percent saying they drink and 50 percent saying they don’t. 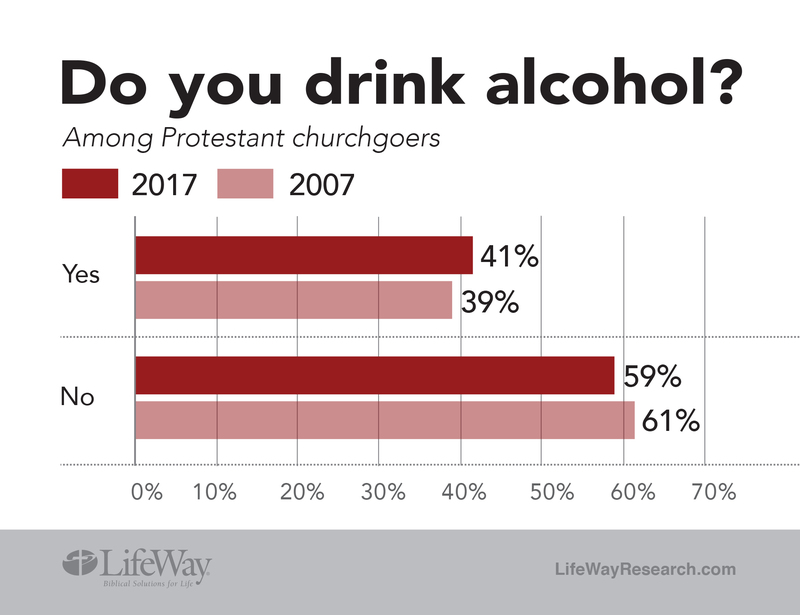 Forty-one percent of churchgoers ages 35-49 say they drink, while 59 percent do not; 44 percent of 50- to 64-year-olds say they consume alcohol, while 56 percent do not. Churchgoers age 65 and above were the least likely age group to say they drink alcohol with 32 percent saying yes to drinking alcohol and 68 percent saying no. LifeWay Research conducted the study of 1,010 American Protestant churchgoers Aug. 22-30, 2017. The survey was conducted using the web-enabled KnowledgePanel®, a probability-based panel designed to be representative of the U.S. population. For this survey, a nationally representative sample of U.S. Protestant and non-denominational adults (18 and older) which attends religious services once a month or more often was selected from the KnowledgePanel®. Initially, participants are chosen scientifically by a random selection of telephone numbers and residential addresses. Persons in selected households are then invited by telephone or by mail to participate in the web-enabled KnowledgePanel®. For those who agree to participate, but do not already have internet access, GfK provides at no cost a laptop and ISP connection. Sample stratification and base weights were used for gender, age, race/ethnicity, region, metro/non-metro, home ownership, education, and income to reflect the most recent U.S. Census data. Study specific weights included for gender by age, race/ethnicity, region, and education to reflect GSS 2016 data. The sample provides 95 percent confidence that the sampling error does not exceed plus or minus 3.1 percentage points. Margins of error are higher in sub-groups.